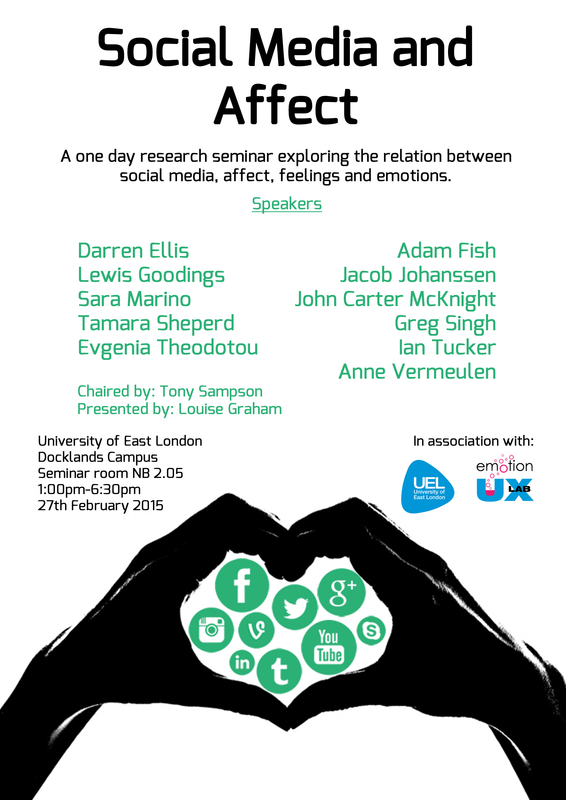 Affect and Social Media: International research seminar, including book launch for Ellis and Tucker’s Social Psychology of Emotion published by Sage in March. Hosted by the EmotionUX lab in the School of Arts and Digital Industries, University of East London. Friday 27th Feb, 2015 at UEL’s Docklands Campus. Meet 12.30 at Docklands Campus reception 1pm start! Sara Marino (University of Westminster): Performances, belongings, and displacements. How Italians use new media to narrate their diasporic experience. Evgenia Theodotou (AMC, Greece): Social network in higher education: a case study investigating creativity in the Greek context. Ian Tucker (University of East London) and Lewis Goodings (Roehampton): Digitally mediated distress: Bodies, affect and digital care. Sara Marino, University of Westminster Dr. Sara Marino is Research Fellow at CREAM-Centre for Research and Education in Arts and Media, University of Westminster. Her main research interests include the digitalization of contemporary Italian Diaspora in UK, and more generally the impact of digital media (online communities, social networks, discussion forums and blogs) in the processes of integration/communication between migrant communities and receiving countries. She also writes on transnational cinema and diasporic audiences, with a specific focus on von Trier’s cinema and the representation of Otherness. Anne Vermeulen, University of Antwerp Anne Vermeulen is master in Social-Economic Sciences (University of Antwerp, 2010) and master in Communication Studies: Strategic Communication (University of Antwerp, 2011). Since October 2011, she works as a PhD student and research and teaching assistant at the Department of Communication Studies at the University of Antwerp. She is a member of the research group MIOS. Anne’s main field of interest concerns the link between youngsters and ICT. For her PhD, she studies how youngsters share their (positive and negative) emotions with others; when and how do they use different communication modes (face-to-face and specific types of mediated communication) to share their emotions with strangers, friends and family? John Carter McKnight, Lancaster University John Carter McKnight is a postdoctoral Research Associate in the Department of Sociology Lancaster University. His work, funded under a grant from the Research Councils UK Digital Economy Theme, examines how peer to peer digital lending and payment services present themselves as alternatives to mainstream banking practices through infrastructure, user experience, and marketing design, with a particular focus on the role of affective design and marketing in speaking to regional and class issues in promoting alternatives to high street banking. Adam Fish, Lancaster University I am a social anthropologist of digital culture, business, and politics. I investigate the interface of economic and political power, cultural discourses and practices, and networked communication technologies. These interests coalesce into critical and ethnographic investigations into media industries and media activism. Based on my ethnographic research into media companies in Hollywood and Silicon Valley, I am presently writing a book about the corporate myths of media “democratization” and internet and television convergence. In my present project I am investigating the politics of information infrastructures through ethnographic fieldwork with cloud computing companies, peer-to-peer banks, and “internet freedom” activists. Jacob Johanssen, University of East London Jacob Johanssen is a third year PhD student in psychosocial studies at the UEL. His research interests include psychoanalysis and media audience research, Freudian affect theory, as well as critical theory. Publications include the anthology ‘Cyborg Subjects: Discourses on Digital Culture’ (edited with Rambatan, 2013) and ‘Alienation and Digital Labour’ (with Krüger, 2014). His PhD thesis explores a psychoanalytic conception of the subject that is both theoretical and epistemological. The research involves interviews with viewers of ‘Embarrassing Bodies’ and explores their viewing practices and affective responses to the programme. Greg Singh, University of Stirling Dr Greg Singh is Lecturer in Media and Communications at the University of Stirling, and is Programme Director of the Digital Media undergraduate programme. He has published widely on a number of subjects ranging from popular cinema, film theory and film-philosophy, and depth psychology, to representations of technology in television drama. He has published two monographs for Routledge (Film After Jung, 2009; Feeling Film: Authenticity, Affect and Popular Cinema, 2014). He is currently working on a book-length study for Routledge discussing psychosocial aspects of digital literacy and Web 2.0. Ian Tucker, UEL Dr. Ian Tucker is Reader in Social Psychology at the University of East London. He has a long standing interest in the social psychological aspects of emotion and affect, which has theoretically informed empirical work in the areas of mental distress, social media and surveillance. He has conducted research for the Mental Health Foundation and EPSRC Communities and Culture Network+, and is currently working on a project exploring the impact of social media on psychological support in mental health communities. Ian has published numerous articles in the areas of mental health, space and place, embodiment, surveillance and social media. Lewis Goodings, Roehampton Lewis Goodings has several years experience researching social media, which began with his PhD work on MySpace and its effects on identity, embodiment and space. He has worked on a number of projects looking at the intersections between technology and experience, for example, a (Roehampton-funded) piece of research entitled ‘Transformative Publics: Social media and the production of bodies online’ which looked at the experience of ‘unwanted’ body-technical assemblages in social media. His interests focus on identifying the role of digital media in the production of communities defined by the way users feel connected, and how such feelings are dependent on the specific aspects of the online environment. More recently, he has been working on a EPSRC funded project with Dr Ian Tucker that is looking at how people use the social media site ‘Elefriends’. Evgenia Theodotou, AMC in collaboration with University of East London Evgenia Theodotou is Programme Leader in Education Department in Metropolitan College (AMC), which in collaboration with University of East London offers Bachelors and Masters Degrees. She is a PhD candidate in the National and Kapodistrian University of Athens in School of Early Childhood Education in the research area of “Literacy skills in the early years settings”. Her research activity involves technology enhanced learning, creativity, arts and literacy skills. She has participated in several research projects and published her research in international conferences, journals, edited books and monographs. She is the author of “When I play I learn… and I better understand” from Delta publications and of “Creativity in the contemporary era of ICT” from Kritiki publications. She is also the author of a series of children’s books which will be shortly available to public. She has a permanent column at “Anna Drouza boro.gr” under the action of “The academic answers your queries”. This entry was posted in Uncategorized and tagged Affect and Emotion, Affect and social media, UEL. Bookmark the permalink.